I cannot believe that I could spend a day just looking at oriental rugs on eBay. Even though the subject is fascinating I feel that the day is wasted. When I was younger it didn’t bother me at all. But these days something is different. May be perception of my own mortality becomes more clear. By the end of the day I realized that the only way to seize the rest of it is, to pick up where I left the Barcelona travel notes. The architecture of Barcelona is huge subject. It is beautiful, eclectic and surreal. There are plenty of masterpieces from the middle ages to modern stunning buildings. The Gaudi is the star of the show. The obligatory visit and contribution of funds (in form of very expensive tickets) to ongoing construction of his last project Sagrada Familia was a live demonstration that in the old times people really made things better. The building which was started in 1880s is still under construction. 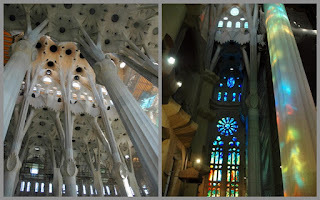 The part that was build in the beginning under Gaudi management is exquisite with intricate façade details. The part which is being built now is interesting and does have reminiscence of signature Gaudi style but looks simplistic at best and cheap at worst. The old façade next to the new part of the building which is still under construction The newly built interiors. I liked them even they are not really Gaudi. The short march from Sagrada and you walk in the less known masterpiece. On the way we passed a strange fountain with a sign which prohibits swimming. I warned you about some surreal elements in Barcelona. What's wrong with looking at rugs all day? A day well spent!